A century-old theory still affects how we treat our babies and can affect children’s learning, according to an NTNU neuroscientist. According to neuroscientist Audrey van der Meer, this mindset can be traced back to the early 1900s, when professionals were convinced that our genes determine who we are, and that child development occurred independently of the stimulation that a baby is exposed to. They believed it was harmful to hasten development, because development would and should happen naturally. 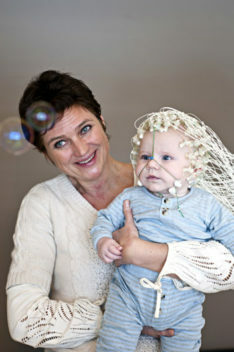 Van der Meer is a professor of neuropsychology at NTNU and has used advanced EEG technology for many years to study the brain activity of hundreds of babies. Van der Meer’s research also shows that the development of our brain, sensory perception and motor skills happen in sync. She believes that even the smallest babies must be challenged and stimulated at their level from birth onward. They need to engage their entire body and senses by exploring their world and different materials, both indoors and out and in all types of weather. She emphasizes that the experiences must be self-produced; it is not enough for children merely to be carried or pushed in a stroller. “Many people believe that children up to three years old only need cuddles and nappy changes, but studies show that rats raised in cages have less dendritic branching in the brain than rats raised in an environment with climbing and hiding places and tunnels. Research also shows that children born into cultures where early stimulation is considered important, develop earlier than Western children do,” van der Meer says. In the 1970s, it was believed that children could only learn one language properly. Foreign parents were advised not to speak their native language to their children, because it could impede the child’s language development. Today we think completely differently, and there are examples of children who speak three, four or five languages fluently without suffering language confusion or delays. “Research shows that children don’t learn language by watching someone talk on a screen, it has to be real people who expose them to the language,” says van der Meer. “When I talk about early intervention, I’m not thinking of six-year-olds, but even younger children from newborns to age three. Today, 98 per cent of Norwegian children attend kindergarten, so the quality of the time that children spend there is especially important. I believe that kindergarten should be more than just a holding place – it should be a learning arena – and by that I mean that play is learning,” says van der Meer. “This applies to both healthy children and those with different challenges. When it comes to children with motor challenges or children with impaired vision and hearing, we have to really work to bring the world to them,” says van der Meer. “One-year-olds can’t be responsible for their own learning, so it’s up to the adults to see to it. Today untrained temporary staff tend to be assigned to the infant and toddler rooms, because it’s ‘less dangerous’ with the youngest ones since they only need cuddles and nappy changes. I believe that all children deserve teachers who understand how the brains of young children work. Today, Norway is the only one of 25 surveyed OECD countries where kindergarten teachers do not constitute 50 per cent of kindergarten staffing,” she said. Lars Adde is a specialist in paediatric physical therapy at St. Olavs Hospital and a researcher at NTNU’s Department of Laboratory Medicine, Children’s and Women’s Health. He works with young children who have special needs, in both his clinical practice and research. “This is due to the rapid development in medical technology, which enables us to save many more children – like extremely premature babies and infants who get cancer. These children would have died 50 years ago, and today they survive – but often with a number of subsequent difficulties,” says Adde. For example, the knowledge that some synapses in the brain are strengthened while others disappear has led to the understanding that we have to work at what we want to be good at – like walking. According to the old mindset, any general movement would provide good general motor function. Babies who are born very prematurely at St. Olavs Hospital receive follow-up by an interdisciplinary team at the hospital and a municipal physiotherapist in their early years. Kindergarten staff where the child attends receive training in exactly how this child should be stimulated and challenged at the appropriate level. The follow-up enables a child with developmental delays to catch up quickly, so that measures can be implemented early – while the child’s brain is still very plastic. “Parents may then be asked to put a sock on the “good” hand when their child uses his hands to play. Then the child is stimulated and the brain is challenged to start using the other arm,” says Adde. A one–year-old learning to walk first has to learn to find her balance. If the child is helped to standing position, she will eventually learn to stand – but before she has learned how to sit down again. If the child loses her balance, she’ll fall like a stiff cane, which can be both scary and counterproductive. In that situation, “we might then ask the parents to instead help their child up to kneeling position while it holds onto something. Then the child will learn to stand up on its own. If the child falls, it will bend in the legs and tumble on its bum. Healthy children figure this out on their own, but children with special challenges don’t necessarily do this,” says Adde. Agyei, van der Weel and van der Meer (2016) Development of Visual Motion Perception for Prospective Control: Brain and Behavioral Studies in Infants. Frontiers in Psychology, vol. 7, 100. Agyei, van der Weel and van der Meer (2016). Longitudinal study of preterm and full-term infants: High-density EEG analyses of cortical activity in response to visual motion. Neuropsychologia, 84, 89-104. For the first time – in Norway and internationally – researchers have looked at the direct correlation between brain size and cancer risk in adults. Researchers at the Kavli Institute for Systems Neuroscience have discovered a network of brain cells that expresses our sense of time within experiences and memories. The area of the brain where time is experienced is located right next to the area that codes for space. Children born with very low birth weights are at an increased risk of cognitive, emotional and behavioral problems throughout their lives. But what exactly happens in the brain to cause these problems?